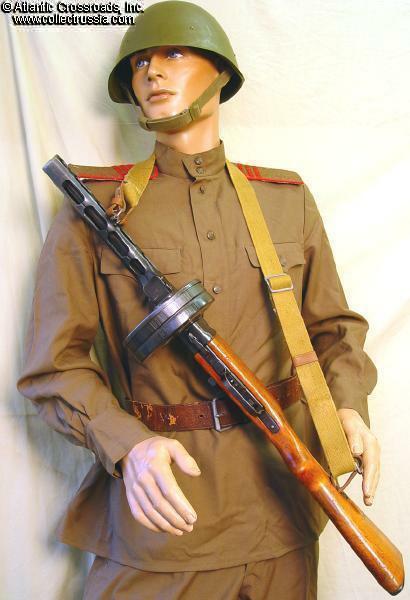 $230.00 Soviet M-43 reproduction Uniform, complete set of large tunic and trousers, style with external breast pockets and subdued buttons. This type of pocket was favored by NKVD troops. Superior quality uniform made in Russia to original specifications. $230.00 M-35 Cavalry Blue piped tunic and pants set. New generation of accurate reproductions made in Russia. Dark olive green in heavy cotton. L size. $230.00 M-35 Infantry raspberry piped Infantry officer tunic and pants set. New generation of accurate reproductions made in Russia. Dark olive green in heavy cotton. M to XL sizes. $230.00 M-35 Artillery Red piped tunic and pants set. New generation of accurate reproductions made in Russia. Dark olive green in heavy cotton. XL size. $130.00 Soviet M-35/40 reproduction tunic. Heavy duty olive green durable cotton. Extra large sizes! $69.00 M 1935 Army Tunic QUALITY "Type S" REPRODUCTION with external breast pockets. Size L. Matching breeches available. $73.00 M 1935 / 41 Army enlisted or officer field gimnasterka pullover shirt with collar tabs. REPRODUCTION, "Type ST". Made in Russia. Approx. size 42 (M). $250.00 M 1943 gimnasterka shirt of an Air Force Colonel in heavy rough wool gabardine with OD painted steel buttons, ORIGINAL Soviet military issue dated 1959. $63.00 M-43 Tunic, "Type B" Original Soviet postwar manufacture, Russian size 3 about a 34. $4.00 White reproduction undercollar for gymnasterka shirt. New, "unissued" condition. Regulations required wearing one when in garrison or on leave. $70.00 Reproduction Breeches in "Type R" olive green cotton, waist size 36-38. Made in Russia. Only a few pairs left, all with manufacturing imperfections. $88.00 Olive Drab Gabardine M-43 Trousers, Original postwar Soviet manufacture, about a US waist size 36. $68.00 M 1935 / 41 Army enlisted or officer field breeches REPRODUCTION "Type ST". Made in Russia. Approx. 36 size waist. Tunic sold separately. $82.00 Officer or enlisted breeches, REPRODUCTION, "Type RT". Made in Russia. Waist size about a 34. $295.00 Reproduction WW2 Camouflage "Amoeba Suit". Recently made in Russia to exact WW2 colors and specifications. Outstanding quality! $295.00 Reproduction WW2 Camouflage "Amoeba" pattern oversized parka. Recently made in Russia, these are superior to previous reproductions with excellent color and accurate details. $295.00 High Quality Russian-made Reproduction WW2 Camouflage "Amoeba" pattern one-piece coveralls, identical to those worn by Soviet combat engineers, snipers, and paratroopers. $12.00 Soviet Navy Telnyashka, traditional long-sleeved striped knit shirt with black stripes. Quality piece in 100% cotton, with woven (not printed) stripes. Available in six sizes: from S to XL. $18.00 Soviet Navy Telnyashka, traditional striped knit shirt with black stripes, WINTER model in heavy 100% cotton fabric. Russian made and indistinguishable from the original Soviet era Telnyashka. Currently available in five sizes: from S to XL. $18.00 Soviet AIRBORNE Spetznaz Telnyashka, traditional striped knit shirt with light blue stripes, WINTER model in heavy 100% cotton fabric. Russian made and indistinguishable from the original Soviet era Telnyashka. Currently available in five sizes: from S to XL. $12.00 Soviet AIRBORNE Spetznaz Telnyashka, traditional striped knit shirt with light blue stripes. Russian made and indistinguishable from the original Soviet era Telnyashka. Currently available in Five sizes: from S to L/XL. $12.00 MVD (Ministry of the Interior) OMON Special Forces Telnyashka, striped knit shirt with maroon stripes, Russian made and indistinguishable from the original Soviet era Telnyashka. Quality piece in 100% cotton, with woven (not printed) stripes. Currently available in six sizes: from XS to XL. $9.00 Airborne VDV Spetznaz Sleeveless tank top Telnyashka, traditional striped knit undershirt with light blue stripes. Russian made and indistinguishable from the original Soviet era Telnyashka. Currently available in seven sizes: from XS to 2XL. $12.00 KGB Border Guards Telnyashka, striped knit shirt with green stripes, Russian made and indistinguishable from the original Soviet era Telnyashka. Quality piece in 100% cotton, with woven (not printed) stripes. Currently available in four sizes: XS and L.